e-book is really convenient and the customer service is really top notch. Elsevier has provided good service to deliver the book and follow ups. Thanks ! "5G Physical Layer" from Elsevier's Academic Press, is the latest title to tackle what is arguably the most complex mobile communications technology to date--5G NR. This is a timely publication that combines a wealth of information obtained from many years of work primarily conducted at Ericsson Research. 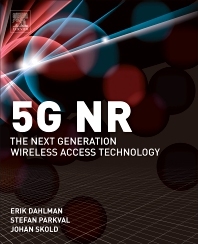 "5G Physical Layer" can be read either as a stand alone reference book or as a complement to Elsevier's 5G NR (ISBN:9780128143230) and should find a place on the desk or bench of any practising RF engineer working in the development, design or testing of 5G NR. Within the time NR has developed, the book is a timely companion to the developing standard, with a focus on the generic techniques and features of NR, and how NR compares with LTE. However, it lacks the detail of many new aspects of NR, that would have made the book indispensable. Assume one has to wait for edition 2 for that, by which time it may be too late for folks working on NR currently.